If you love the great outdoors but also enjoy the comforts of home, adding an outdoor living area to your home will allow you to enjoy the best of both worlds. These trendy living spaces capture the essence of communing with nature without the need to roll around in the grass or hike through the woods. While it will involve an investment of time and money, the benefits far outweigh the cost. One of the biggest benefits of an outdoor living space is the increased family time spent in a relaxing environment. Young children can play outside while you cook or attend to other activities like reading that great book you’ve been waiting to crack open. By adding a pool, the entire family can enjoy fun in the sun without ever leaving home. Don’t forget afternoon picnics and the fragrance of fresh air! Summer is a time for entertaining, and nothing brings people together like spending time in the great outdoors. With a fireplace and an outdoor cooking area, your guests will feel right at home. Just don’t forget to add comfortable seating! If summer bugs are a problem, your home remodeling contractor can screen in the area for you. Otherwise, consider having the area fogged a few days before big parties to keep those pesky insects at bay. Whether you are entertaining guests, cooking dinner outside for the family or just taking some time to rest and relax in your outdoor living area, nature has a way of elevating your mood. In fact, according to South University Clinical Mental Health Counseling instructor Dr. Susanne Preston, spending time in nature does more than elevate your mood. It decreases both depression and anxiety and improves your self-esteem, too. Think of your outdoor living area as a tonic for improving moods and making everyone feel better. 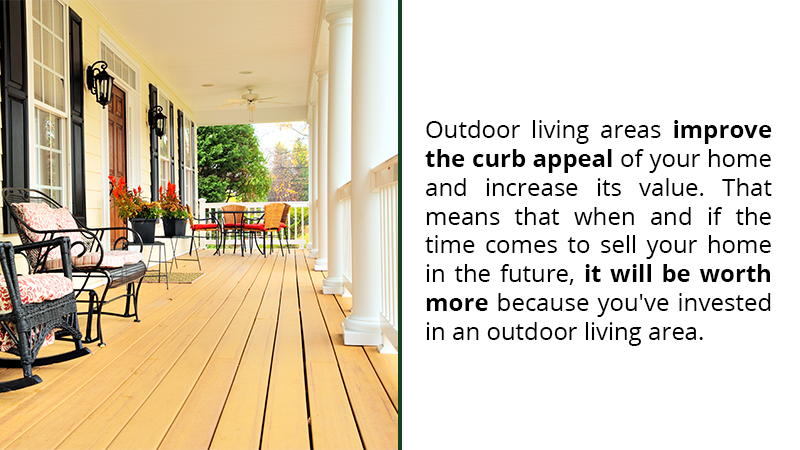 Outdoor living areas improve the curb appeal of your home and increase its value. That means that when and if the time comes to sell your home in the future, it will be worth more because you’ve invested in an outdoor living area. It also enhances the natural beauty of your home and yard and will likely win the approval of those difficult neighbors. If you dream of quiet evenings under the stars, an outdoor living area can be a dream come true. Add fragrant potted plants like lavender or night blooming jasmine to add fragrance to the area. Pots of fresh herbs will serve double duty by adding fragrance and color to the area and providing fresh herbs for cooking when you entertain. Your contractor can install subdued lighting to highlight trees and shrubs near the home. Add a stone bench under a nearby tree, hang a set of wind chimes and get ready for a private retreat that is just right for two. 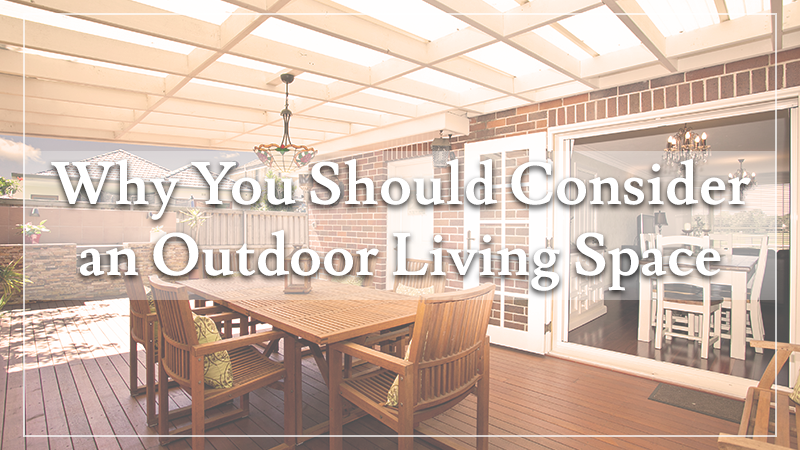 Your outdoor living space is limited only by your imagination and available space. Jot down your ideas and then talk to your contractor about turning your dream into a reality. Contact us today to schedule a free consultation so we can get to work creating your new space!